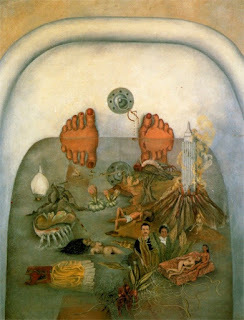 When surrealist painter, Frida Kahlo was a child in Mexico she contracted polio, which left her with a limb length discrepancy in the right leg. As a teenager, she suffered near fatal injuries in a serious road accident coming home from school. An iron handrail impaled her through her pelvis, fracturing the pelvic bone. Frida spent a month in the hospital and two months recovering at home. Combined with post-polio complications Kaho suffered chronic pain for the rest of her life. She did want to become a doctor but realised it was no longer possible so decided to become a medical illustrator, and combine her interests in science and art, and began to paint. She had a specially-made easel to enabled her to paint in bed, and a mirror was placed above it so she could see herself. Painting became a way for Kahlo to explore questions of identity and existence. In 1922, she first met Diego Rivera when painting a school mural and he was impressed with her works. Despite their age difference, they began a relationship six years later and married in 1929. 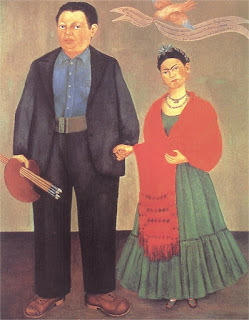 Kahlo, was too frail to work but Diego paid for her expensive medical treatments and they became a celebrated couple courted by the media. At first, most of her paintings were portraits of herself, her sisters, and school friends. Initially influenced by Renaissance masters she began to integrate the avant-garde . After her maiden exhibtiton on New York in the same year, she fell ill and it was discovered she had a trophic (penetrating) ulcer under her right foot. Her spine was adversely effected and some historians believe she may have been born with spina bifida. 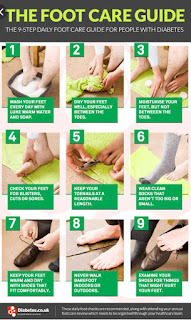 For the next decade, Frida was in constant pain from her back and right foot. She wore a series of body casts and was forced to take to her bed for long periods. In her short life, the artist endured over 30 surgeries, multiple hospitalizations, and countless months of bedrest. Eventually in 1953, after gangrene set into her right leg she had a below knee amputation. 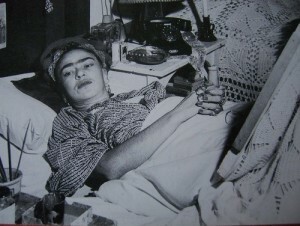 Frida suffered constant pain and self medicated with brandy and pain killers. Devistated, she. tried to make light of the loss, writing the poignant phrase, "Pies para que los quiero, si tengo alas pa' volar?" (Feet, why do I want them if I have wings to fly? 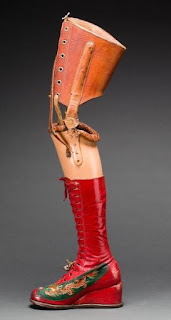 She also fixed a bell to her leg brace and petticoats which jingled as she moved. 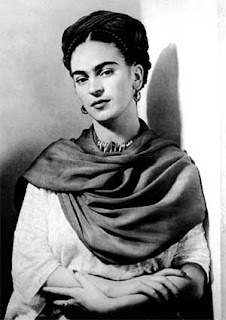 Sadly Frida died in 1954 from a self-administered morphine overdose.